In this remarkable collection of interviews with seven people who've died, Irene Kendig, with the help of a gifted medium, explores what happens when we transition from physical to non-physical life. Each of the seven dialogues begins with the same question: "What did you experience when you released your last breath on earth?" This book is for anyone who has ever wondered whether there is a Heaven or a Hell, a Judgment Day, or a reunion with loved ones. It will inspire and illuminate your heart and mind whether you believe in an afterlife or not. These dialogues explore life from a spiritual perspective and address the fundamental philosophical questions we all have about life, which elevates consciousness and empowers you to make choices in alignment with your soul's purpose. The responses offered by Ms. Kendig's loved ones not only diminish fear of dying, they provide solace and strength for those who grieve, and inspire all to live courageously, joyfully, and respectfully . . . now. "This remarkable book by Irene Kendig offers deep comfort and gentle peace to anyone grieving the death of a loved one." "Irene Kendig has written a very important book. Many of our beliefs about death are based on superstition and myth; the truth is so much more empowering. You will be intrigued by both her questions and her ability to state the answers in such a way that we can all live better lives while we're 'alive.'" "I have communicated with the deceased, had messages from them through mediums, had a near death experience and a past life experience. This book speaks truth. Consciousness is immortal and distinct from the body." "This wonderful book, filled with love and wisdom, provides many answers about our 'deceased' loved ones. Highly recommended." “This amazing book of conversations with people from the 'other side' will be intriguing to skeptics, fascinating to the curious, and enthralling to believers in reincarnation and past life regression. Irene Kendig asks all the right questions, and gets answers that can help us all live better on 'this side.'" "This simply delightful book is chock full of wisdom and healing. Irene has a gift of presenting complex spiritual concepts in a very easy to understand, common sense, and fun way. This is one of those rare books that is hard to stop reading. Highly recommended!" -David H. Paul, M.D., Ph.D.
"This 'Work of Love' is a fascinating and intriguing read full of surprises, infinite possibilities, and assurances that there is indeed life after death. Irene permeates the conversations with her insights and learnings, enabling readers to experience the dialogues from their own level of Consciousness and Light. It is a privilege to offer words of support for this enchanting book." “I fully intend to use this life-affirming book to facilitate my grieving and dying clients in opening up to new ways of thinking. This is a delightful guide to our inner Spirit that diminishes death anxiety. Everything is in order and everything is for the greater good. No conflict of interest for Christians, Buddhists, or Jews. This book will be a great contribution to so many!" "Powerful, courageous and enlightening, Conversations with Jerry and Other People I Thought Were Dead restores our conscious awareness to the continuity of life and our eternal nature as unconditional love. Irene opens our hearts and minds to a deeper understanding of the journey of our soul." “I was uplifted by the wisdom and compassion of these dialogues. The perspective offered from the ‘other side’ does much more than clarify what dying and the afterlife are about. These dialogues address the fundamental philosophical questions of life in a very clear and loving way. Irene Kendig gently but consistently shows the reader how life always invites us to take responsibility and let go of judgment. I am grateful for this book." "As I read Conversations with Jerry and Other People I Thought Were Dead, I began marking important passages and keeping a record of the pages. Then I began underlining passages of exceptional clarity. I soon realized I was marking nearly every page because nearly every page provided new and clear understandings. I have been studying near-death experiences for fifteen years and gaining bits of information about life beyond the physical. Each NDE is like a thread. Then I read Jerry's descriptions of life beyond and I saw the tapestry. That's the real significance for me. I feel like a study of NDE is unnecessary any longer because I have the whole picture." "We all learn by association in our early developmental years. As such, the experience we call death becomes misperceived as negative once we have unconsciously associated it with fear, pain and/or suffering. As I opened my mind and sincerely contemplated the possibilities that Irene has so lucidly communicated in this book, my heart expanded, my fears ceased to exist, and I appropriately re-associated hope with the birth we've named death." "Author Irene Kendig strikes gold while digging for answers about life from those who have lived, died, and are now 'living on.' It is impossible not to learn something about life from this book. Some of the revelations are startling, some are simple, some are complex, some are transforming, and some are comforting, while others are controversial and difficult to fathom. Almost every page of this book has decidedly profound insights to offer. Kendig's interviewing skills are incredible. Her questions are direct and weighty. Her writing is concise and cohesive. The book not only presents the reader with specific details about our transformation in death, it is also brimming with suggestions that can transform us into happier, more loving and forgiving people in life." "This amazing book of conversations with people from the 'other side' will be intriguing to skeptics, fascinating to the curious, and enthralling to believers in reincarnation and past life regression. Irene Kendig asks all the right questions, and gets answers that can help us all live better on 'this side.'" "A 352-page compendium that includes an informative introduction, a 'Notes to the Readers' section, and an Epilogue, Conversations With Jerry And Other People I Thought Were Dead features extended 'conversations' that touch upon a wide range of issues and questions. Of special note for students of metaphysics is what happens to human beings when transitioning from a physical to the non-physical life. 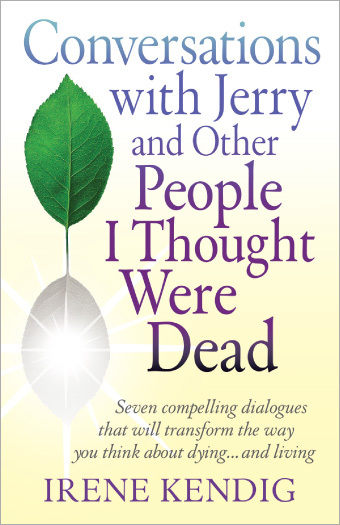 Offering a wealth of spiritual wisdom, insights, and perspectives, Conversations With Jerry And Other People I Thought Were Dead is a fascinating and informative read which is strongly recommended for both personal and community library collections." “What does it feel like to take one’s last breath as a living person and one’s first in the world of spirit? Author Irene Kendig asks the ‘deceased’ this and other thought-provoking questions in her book, Conversations with Jerry and Other People I Thought Were Dead. The answers she receives through gifted medium Jana Anna will surprise, delight, and comfort readers.